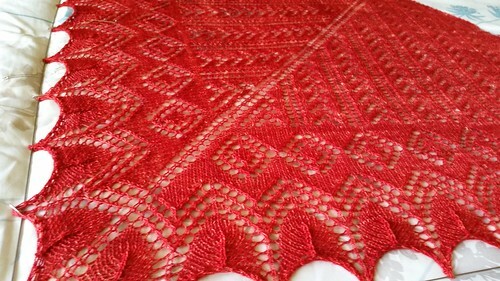 I am so glad we decided to use red for this shawl. I just love it! I took these pictures on my new Samsung GS5 which I got this week. I loved my GS3 and planned to upgrade this year. I was trying to hold out for a 32GB version but caved and got the 16GB a few days ago. It does take pretty good pictures. They look even better on the phone itself since it has an awesome display. 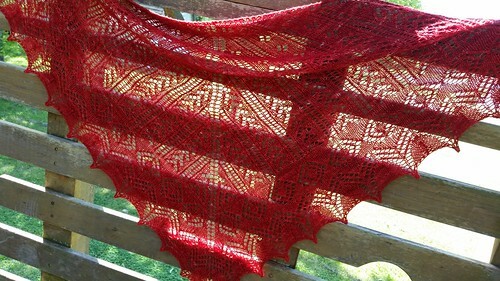 Anyway, back to the shawl. 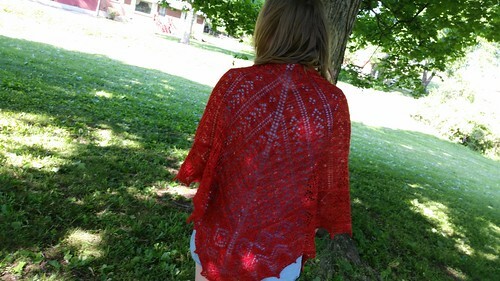 As a reminder this is another of Dee O’Keefe’s designs, Alexandra and is knit from Classic Merino Superwash Sock in the color Ruby. 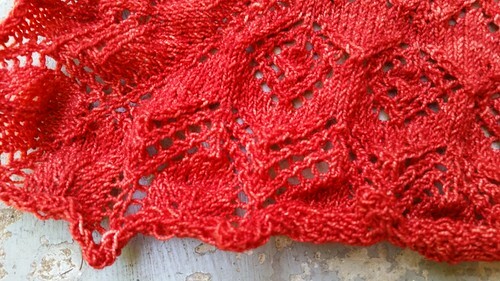 We used just under 2 skeins and size 5 US needles for our sample. 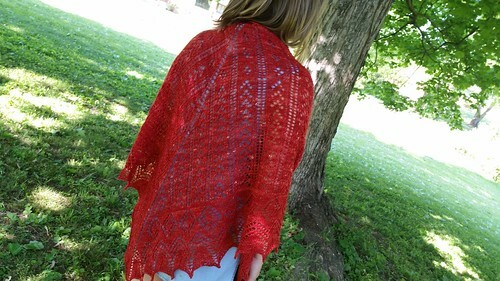 We have the pattern on our website and Dee has it available on Ravelry. It is on the large side as written. I measured it after blocking at roughly 68” at the top edge and 33” at the center spine. I took a few pre-blocking and during blocking shots too. 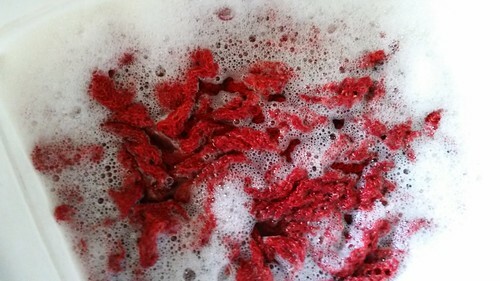 Here is how it looked before it’s soak. It’s amazing to watch the transformation isn’t it? In the tub with some shampoo for a soak and then into the washing machine for a spin. 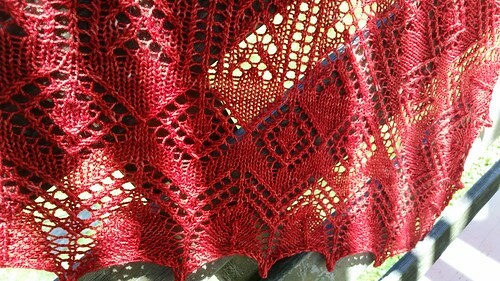 Here it is on the blocking wires. 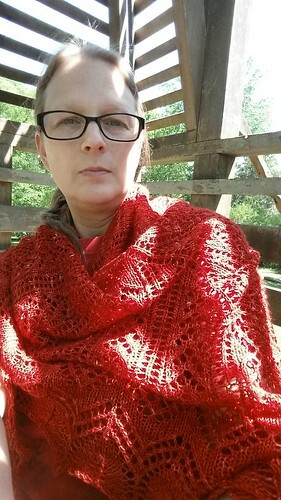 In other knitting news, the other three shawls, Nadira, Edwina, and Kimani have all hit the border stage but I didn’t bother with new pictures just yet. We should have three more off the needles very soon. 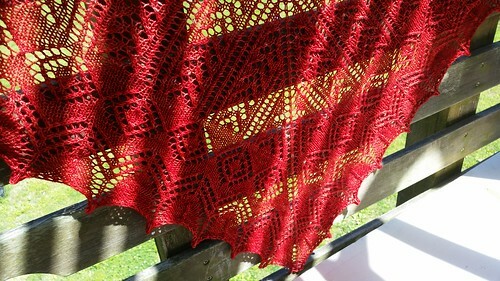 Joanie has already started a new shawl which I fill you in on the details of in my next post.